Once you start sewing seriously, you realise pretty soon that the projects based on your carefully curated pinterest images don’t always roll off the home sewing machine quite as easily as envisaged. Boy, have I had a run of ‘this isn’t quite what I thought it was going be’ projects recently – to be covered in future blog posts. But this one, this was a dream, both in construction and result, I don’t think I even had to use the unpicker once. That never happens. 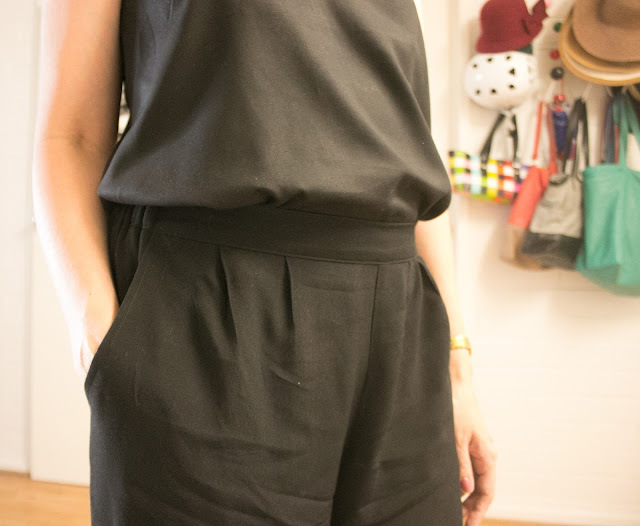 Way back in February, when the days were stiflingly hot, I wanted a black on black cami and loose wide legged pants to wear on hot summer nights. 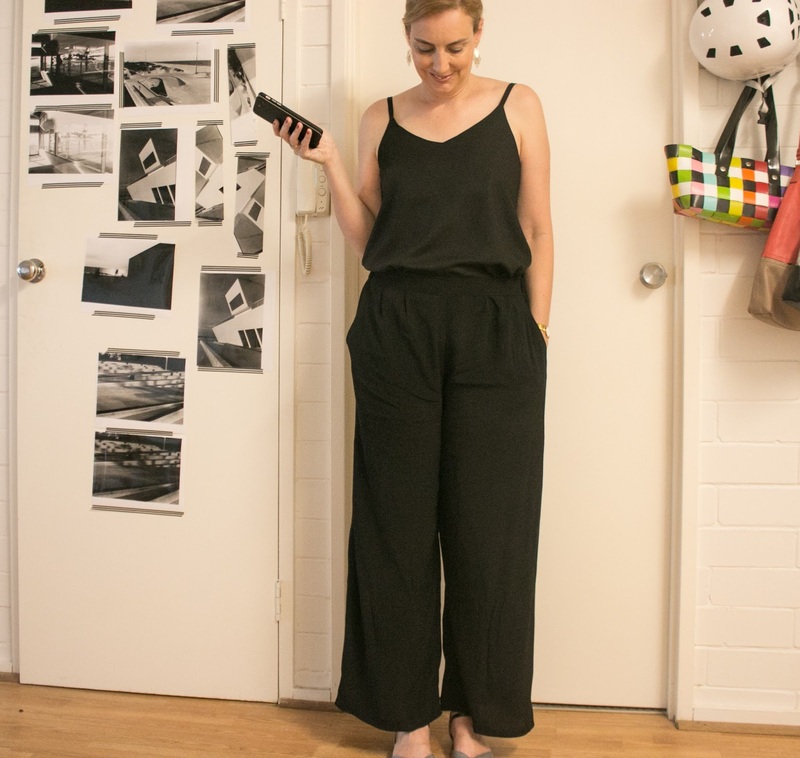 Two separates that could look like a jumpsuit but save me the awkward stripping-off-completely-to-go-to-the-bathroom bit. 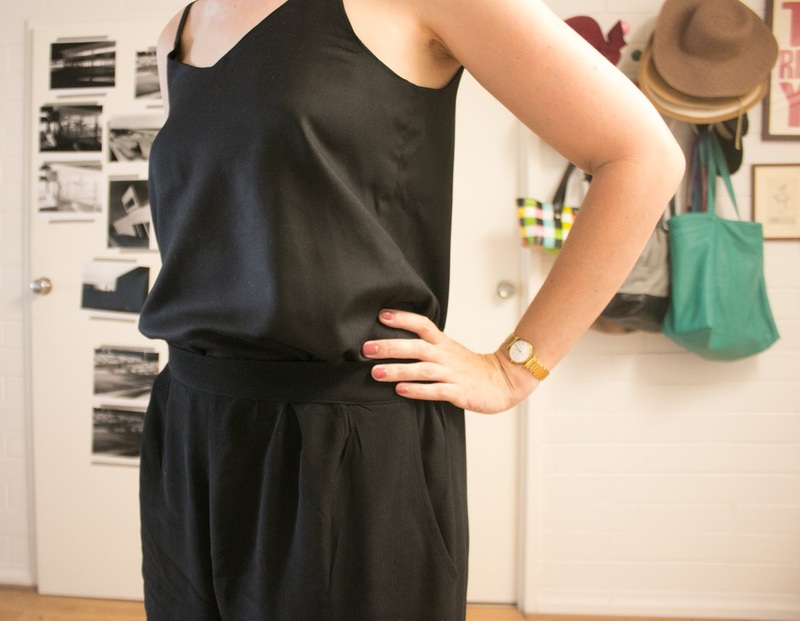 On top have the justly famous Ogden Cami by True Bias, in a smooth black rayon. A simple but very effective pattern, with a loose fit and neat facings inside that enclose the straps. 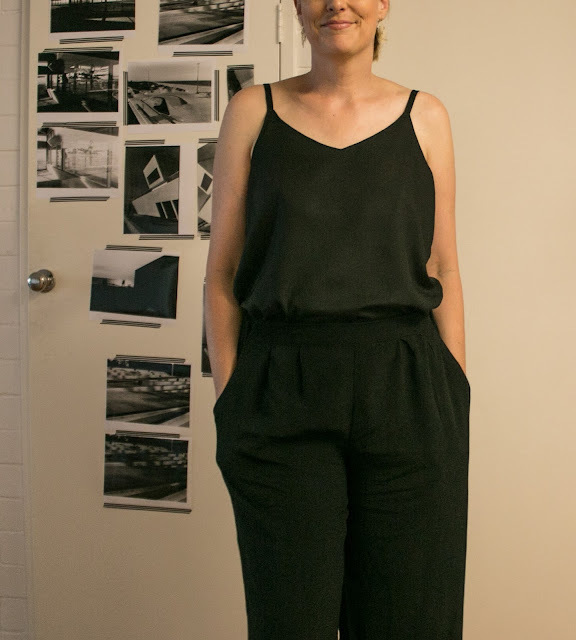 Then there are the pants – the Itch-to-stitch Belize shorts extended to the ankle. This is a nice pattern with pockets, pleated front and a waistband that is flat at the front and elasticated at the back. I must have been feeling confident because I pondered the leg shape for a bit, then decided to just go for and added a straight 24 inches, almost freehand with a long ruler and rotary cutter. The fabric is another Spotlight rayon, but it’s a rayon chirramon, not a fabric type I have ever heard of before. The only links google brings up lead back to Spotlight, so maybe it’s a word or brand they invented. Anyway it’s a nubbly, crepey textured rayon with a slightly matte finish. It worked. 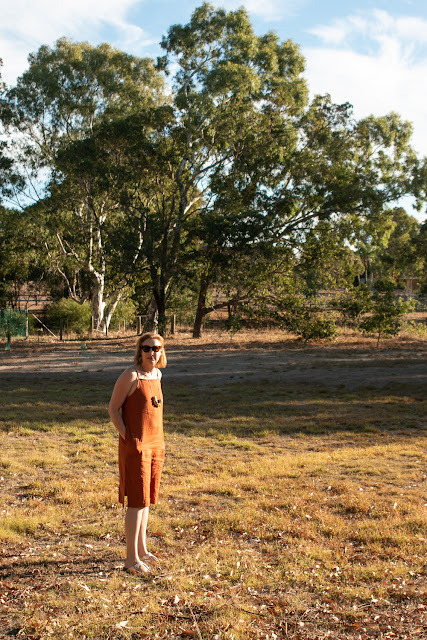 I finished these in a day and wore the whole outfit out that night, first to La Soiree, a bizarre, hilarious cabaret circus at the fringe festival and then a balmy night in the Urban Orchard and felt very cool, in both senses of the word, all evening. I’ve also got some wear out of the pants with other tops at work and the cami with jeans on other outings and I can happily say that one of those pinterest dreams has been covered. I started pursing sewing as a serious hobby after I bought a beautiful, very expensive silk shirt with a tiny brown hounds tooth check pattern. After one wear, it became clear that the silk had not been tested or colour-fixed, and the dye ran in the arm pits, rendering the blouse totally unwearable. After leaving the shirt hanging sadly in my wardrobe for a year, I threw it out but I'm still annoyed. That's when I decided to try and make my own. Tea house or work house?